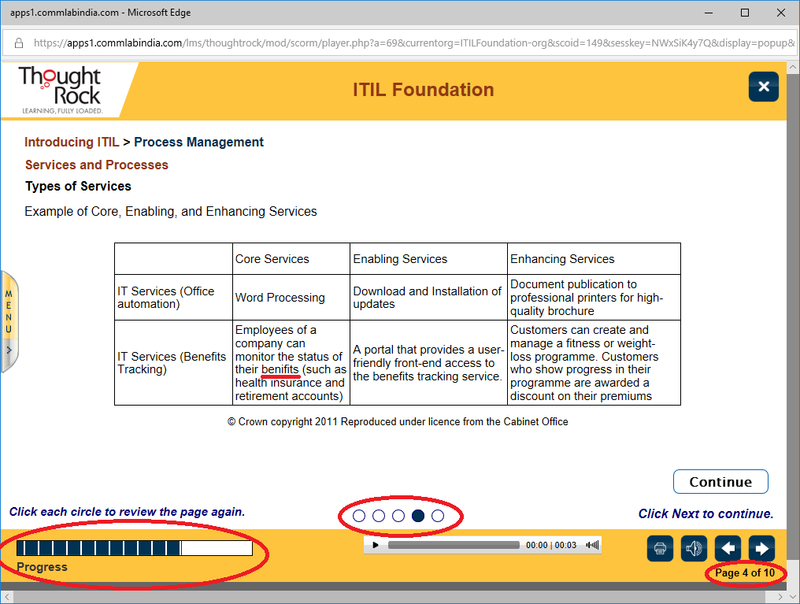 I bought a copy of ITIL for Dummies in December 2013, but I got bogged down by about chapter 3. I think that a lot of ITIL definitions tend to be a bit circular, so it sounds like this: “The purpose of the froxnab mullginator is to mullginate your froxnabs.” That may well be true, but it won’t explain anything if you don’t already know what the terminology means! That’s their emphasis rather than mine. Looking at the front cover of the ITIL for Dummies book, it says “Learn to [..] implement ITIL in your organisation”. Although the back cover mentions the Foundation exam, I don’t think that this book is the best place to start; it might be worth reading it later to supplement what you’ve learned elsewhere. Last week, I took a Udemy course by Jason Dion: ITIL Foundation: Cram to Pass the ITIL Exam in 7 Days! The same instructor has also done a longer course: ITIL Foundation: Your Complete ITIL Exam Preparation Course. Since they’re the same price, I’d normally opt for the course with more content so that I can understand the subject in more depth. However, this comes back to my comment about the syllabus changing; I didn’t think it was useful to spend too much time on the current version, since I’ll have to relearn it all for ITIL 4 next year. Instead, I chose to focus on what I needed for the exam. NB Just to be clear, this is not the same as using a “brain dump”, where you get an illicit copy of the real exam questions and just memorise those specific answers. Most forums will ban you if you post links to those sites, and I’m disappointed that Quora is an exception where people blatantly advocate this. Udemy seems to be a bit like DFS (a UK furniture shop), where they have nominal prices for courses but they’re always having some kind of sale. In this case, both of Jason Dion’s courses have a full price of £199, but it was reduced to £15 on the day I visited. (I’ve seen the price fluctuate between £10 and £20.) I suspect that this is a psychological trick known as price anchoring, to make people feel as though they’re saving money. In this case, I think that the course is worth £15, but if I’d paid £200 then I’d be asking for a refund. So, he was correct, but his accompanying slide only showed 24 processes with no indication about which were/weren’t covered in the exam. I’ve put the “big 4” in bold: these are the processes where you need to know the basic concepts, activities, and interfaces. I’ve crossed out the 4 processes which aren’t covered in the exam. (Service Strategy) Business Relationship Management. It’s not just that slide: those 2 processes aren’t covered in any of the lectures, although the practice quizzes ask questions about them. So, you’ll need to go elsewhere if you want the full syllabus. Aside from that issue, Dion’s course is pretty good. I only noticed one typo, and no real mistakes. A while back, I used to see a lot of books with titles like “Teach yourself Java in 24 hours”, and I thought “Great, I’ll start that on Saturday and do the whole thing over the weekend.” In fact, this was slightly misleading; the books contained 24 chapters that were intended to take about an hour each, but if you could only do one chapter a day (e.g. after work) then it would take you a few weeks. Even in the best case scenario, you should allow some time for eating, sleeping, etc. By contrast, Dion’s cram course says “7 days” in the title, but there’s only 3 hours of video content. It took me 4 days to get through it all: you need to allow extra time to take in the content of each lecture, and I had to replay a few of them when I realised that I hadn’t been paying attention. There are several practice questions as you go along, and 2 mock exams at the end. With the practice questions, you get immediate feedback to tell you whether your answer was correct. Unlike the mock (and real) exam, they’re untimed, so you can think about them for as long as you like. Just bear in mind that you need to average 90 seconds per question in the real exam. (You might get extra time if English isn’t your first language.) I was a bit concerned that it was taking me a long time to understand each question and figure out the answer, but that really comes down to familiarity. When I took the mock exams, I only needed 30 minutes for each: 20 minutes to actually answer the questions and 10 minutes to review my answers. It’s worth noting that 2 of the questions in the second mock exam are identical, and at least 5 other questions that are repeated between exams. So, although there are 2 mock exams with 40 questions in each, you aren’t actually getting 80 unique questions; it’s more like 70-75. Dion advises that you’re ready for the real exam if you score at least 85% in each of the mock exams; I got 87% in the first exam and 95% in the second. Axelos have released an official app, which cost me £5. It worked fine on my iPhone, i.e. you don’t need a big screen. It took me about 30 minutes to read through the case studies (all about Brigitte’s trip to the alps), then there are 300 test questions. If the exam has 40 questions in 1 hour, you should be able to get through all of these in 7½ hours. Realistically, it makes more sense to do a few at a time, e.g. while you’re waiting for a bus or when you’ve got food in the microwave. I didn’t get through all 300 questions before my real exam, but at least one of them asked about information which wasn’t included in Dion’s Udemy course (service provider types). So, I recommend this app: it might highlight gaps in your knowledge, and it’s a lot cheaper than taking (and failing) the real exam. I’ve taken several IT exams in the past (Cisco, CompTIA, Microsoft, etc.) and I normally go to a test centre. You can go to Pearson Vue for this, but they charge £274.00 + VAT = £328.80. Alternately, you can take the exam at home, proctored via webcam. I’m guessing that one proctor can watch several candidates simultaneously, a bit like a security guard watching a set of CCTV images. If you do the exam online, you need to book it via PeopleCert. You can either pay them directly or buy a voucher from someone else and then enter the voucher code on the PeopleCert website. PeopleCert normally charge £299, which is currently reduced to £269. They haven’t mentioned VAT, so I assume that it’s included in the price. Dion Training (run by Jason Dion) sells vouchers for $299 (roughly £233). ITIL Prime charge $299 (roughly £233) for the exam voucher. If you want training too, it goes up to $631 (roughly £492). Thought Rock charge $270 (roughly £211) for training and an exam voucher. NB I’ve mentioned VAT in the UK prices. If you’re a contractor with your own limited company, or you can persuade your employer to pay for this, the company should be able to claim that VAT back when it submits a tax return. The US companies didn’t mention it, but I assume that they’re complying with the relevant legislation. All of these prices are correct on the date of posting, but they might change later, so I’d advise you to just use this as a starting point. Similarly, exchange rates will fluctuate; right now, $1.00 ~= £0.78. The IT Skeptic has also offered some advice on this, so it’s worth checking his post for any updates. In any case, it doesn’t make sense to pay PeopleCert directly. Thought Rock are currently the cheapest by a significant margin, even if you ignore all their training and just use the exam voucher. 15 minutes later, they sent me a follow-up email, asking for my first name, surname, and email address. Given that this message was sent to my email address, and it started “Dear John”, I’d argue that they already had at least 2 of those pieces of information, and the PayPal payment should have given them all 3. Maybe they’re thinking about a situation where you pay for someone else, e.g. if the finance department pay for IT staff to do this training? Anyway, I replied immediately, then I got another email about an hour later. So, it didn’t take as long as 24 hours, but it’s also not the instant response that I’ve come to expect from other websites. The third email gave me credentials to log into the Thought Rock training site (outsourced to Commlab India). It also gave me a voucher code, but this wasn’t a voucher for the PeopleCert website. Instead, I had to redeem that voucher on the Thought Rock website. They then sent me a fourth email with an attached pdf, and this pdf contained a voucher code for PeopleCert. The PeopleCert voucher expired on “08/11/2019”; I’m not sure whether that’s using the UK or US date format, which demonstrates why everyone should use the ISO 8601 date format. However, I redeemed the Thought Rock voucher on 2018-11-13, so it’s plausible that it would expire after about a year. The 2-step voucher process seems needlessly complicated; the only potential benefit would be if you took a long time on the training, and didn’t want to book the exam until later. However, the Thought Rock email said: “Please note your course access will expire at midnight on the night of (April 13th, 2019). You must complete your training by this date.” So, you have 5 months to complete the training course. Even if that’s not sufficient, and you want to do other training before the exam, I think that a year from your initial purchase is still more than enough time. As for the actual training, I wasn’t very impressed. There’s some useful information here, but the course doesn’t make much of an effort to rephrase it from the official ITIL books. So, if you don’t understand the books, you won’t gain much from this course. In some cases, it’s obvious that the speakers don’t understand what they’re reading, because they emphasise the wrong words in the sentence. E.g. in module M8: “Across all services, resources and capabilities are linked forward.” The way it’s spoken sounds as if “services, resources, and capabilities” are all part of the same group, so this is actually counter-productive. You’d be better off turning off the audio and just reading the slide yourself, to realise that “resources and capabilities” are grouped together across all services. On the other hand, there are also slides that contain mistakes in the text, e.g. “lifecycle” is not the same thing as “lifestyle”! I’ve underlined the spelling mistake, but it’s also worth noting the navigation. The bottom right corner says “Page 4 of 10”, but the circles indicate that this is page 4 of 5 within the other page 4. So, you have two nested levels which are both called “Page”. Meanwhile, these don’t map directly to the progress bar in the bottom left corner, because this set of 10 pages might be followed by another set of pages, and they all get added together for the total length of the bar. It would make more sense to just have a single set of pages per module, with a single way to navigate back and forth. At the end of the training, you can take a mock exam, but this is poorly implemented. In the real exam, you can mark questions for review and go back to look at all questions before you finish. In the mock exam, you only get one chance to do each question. Also, for some reason they only give you 45 minutes rather than an hour. When you get the results, it doesn’t tell you which questions you got right or wrong; it just gives the overall score. The real exam groups that score into sections, so again the mock exam does it worse. So, apparently I completed the course 49 years before I started it! (Also, I managed to do that several years before I was born.) This really means that the web developers made a mistake. In Unix, dates are represented by the number of seconds since the epoch: 1970-01-01 00:00 UST. Allowing for time zones, this corresponds to 1969-12-31 19:00 EST. (Stack Overflow has a discussion about this.) So, rather than storing the actual completion date, they just stored zero as the default value, then formatted that as if it was a real date. This isn’t disastrous in the grand scheme of things, but it reflects a general lack of attention to detail. I doubt that I’m the only person affected by this, but nobody has bothered to fix it. After I got the voucher from Thought Rock (see above), I went to the PeopleCert website. This continued to be an exercise in frustration. Firstly, I had to create an account on their website, but I discovered that they won’t accept special characters in the password. That weakens security for me (since there are fewer possibilities), and it implies that their developers are worried about attacks (e.g. SQL injection or XSS); however, if they’re hashing the password and using stored procedures then they should be able to eliminate those risks. Next, I tried to book the exam. I clicked my timezone, then the day, then the 8 hour window, then the specific timeslot. However, the “SELECT” button stayed greyed out, so I couldn’t actually choose that time. I thought that this might be a browser compatibility problem, but I tried 3 different browsers (Microsoft Edge, Internet Explorer 11, and Firefox 63.0.1) with the same result. I ended up phoning them so that they could book the exam for me. I was using a wireless network (rather than an Ethernet cable). The laptop was running off batteries (not plugged into the mains). After that, it displayed a countdown timer, and I couldn’t proceed until the final 10 minutes before my exam was due to start. I sat in a room that just had a table and chairs to do the exam. The proctor asked me to rotate the camera through 360°; despite the previous warnings, you basically need to unplug any cables from your laptop before you do this, otherwise it will all end up in a big tangle. Normally I turn my mobile phone off before I do an exam, but in this case I was told to leave it on (in case they needed to contact me). However, I also had to place it out of reach, rather than leaving it in my pocket. Considering that the ITIL exam is all about service management, it’s ironic that so much of this is user-hostile. Once the exam actually started, it went a lot more smoothly. You can mark questions for review, and go back and forth at will. I found that in several cases I was able to answer the question immediately (1-2 seconds): if you’re familiar with the terminology, you can guess the answer before you’ve finished reading the question. There was a message at the start, saying that there weren’t any trick questions, and I’d basically agree with that. However, do read the questions carefully. E.g. if the question asks which function (group) performs a particular task, don’t choose a process as your answer. It took me 30 minutes to do the exam, including the time to review my answers, so I was nowhere near the 1 hour limit and that’s comparable to the practice tests I took earlier. When I finished the exam, I had to do a short survey about the booking process. They then displayed my results on the screen, and I scored 75%. That’s a bit lower than the Udemy tests, and roughly the same as the Thought Rock test. The pass mark is 65%, so I passed with a comfortable margin. This was on Friday afternoon (2018-11-16 17:05), and I received an official email from PeopleCert on Monday afternoon (2018-11-19 13:42). If there hadn’t been a weekend in the middle, it might have been a bit quicker, but 2-3 days isn’t too bad. I then logged into the PeopleCert website and downloaded a pdf copy of my certificate. If you want a printed copy, they’ll charge £29.40 (£42 minus a 30% discount), plus an extra £36 if you want a courier rather than standard delivery. The pdf doesn’t have any DRM protection on it, so I recommend printing out your own copy instead! It would have to be very swanky to justify that price (e.g. a vellum scroll or engraved on metal) so this seems like a total rip-off.